One of the few books written by a master mason and masonry teacher, this text covers basic masonry skills such as plan reading, scaffolding, cleaning masonry and concrete work in detail. The best selling masonry resource for over 18 years, it provides step-by-step instructions for building fireplaces, chimneys and arches as well as many other projects with complete plans. Each unit offers helpful suggestions for application of fundamental skills and up-to-date safety and OSHA information as well. The material is presented in sequence, as skills are developed. Each unit integrates trade math, projects, reviews. Each section offers a summary and review to evaluate the students progress. Richard T. Kreh, Sr., is a retired master mason, a former building trades and masonry instructor with Linganore High School (Frederick, Maryland), and a well-known expert in the masonry field. He has written for Taunton Press and Masonry Construction Magazine, in addition to authoring several respected textbooks, including SAFETY FOR MASONS. He holds bachelor's and master's degrees in education. Development and Manufacture of Brick and Concrete Block Masonry. Tools and Equipment. Mortar. Essentials of Bonding. Laying Brick and Concrete Block. Masonry Practices and Details of Construction. Scaffolding and Cleaning Masonry Work. Fireplaces and Chimneys. Arches. Concrete. Understanding and Reading Construction Drawings. Masonry as a Career and Masonry Projects. 5. Masonry Skills (hardcover) Kreh, Richard T.
6. 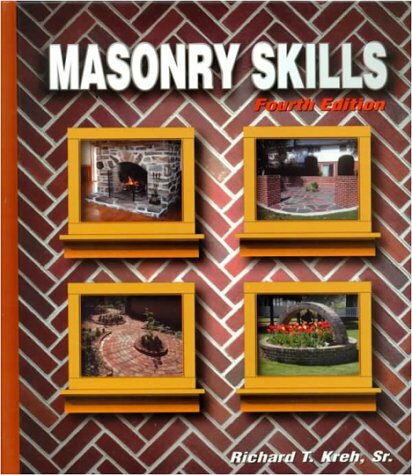 Masonry Skills (hardcover) Kreh, Richard T.